Will Not Wearing a Seatbelt Have an Impact on My Bus Accident Case? Home » The Law & You » Will Not Wearing a Seatbelt Have an Impact on My Bus Accident Case? While riding on the bus to New York, a viewer broke his teeth when the bus rear-ended a car. Since she didn’t have her seat belt on at the time of the accident, will that prevent her from getting the funds needed to fix her teeth? 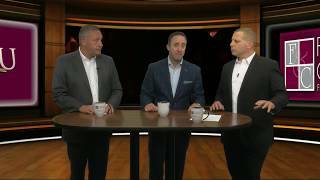 Dave Kuharchik: We’re addressing a bus accident in this edition of “The Law & You.” Back with us from the virtual law center are attorneys Greg Fellerman and Ed Ciarimboli. Guys, thanks for being here. Ed Ciarimboli: We should be doing this in a pool. Dave: “Law and You” live by poolside. I like it. Maybe that’s next week, we’ll have to see. Ed: Cool us down on the lake or on the boat. Greg Fellerman: Whatever you need. Ed: Cool us down a little bit. Dave: It’s been a rough couple of weeks with the heat and humidity. Dave: Well, it’s going to change. Things will change and, unfortunately, life has changes. And that takes us to our question. Leslie got involved in an accident she wasn’t suspecting. She’s from Tannersville and she says, “I was on the bus to New York and the bus rear-ended a car. I hit the seat in front of me and broke my two teeth. I didn’t have my seatbelt on. Will that prevent me from getting money to repair my teeth?” So, although Leslie had nothing to do with the fault of the accident, she’s wondering about the action of not having her seatbelt on? Ed: You know, Leslie, it’s a very good question and it’s something that comes up a lot in the context of automobile crashes, tractor-trailer crashes because some people still don’t wear their seatbelts. And not a lot of people wear a seatbelt on a bus so you not wearing your seatbelt is not all that uncommon. In the state of Pennsylvania, whether you had your seatbelt on or not is not admissible. So, it will not prevent you from making a recovery for your injuries. The aspect of having a seatbelt on or not had nothing to do with the bus driver not operating that vehicle in a reasonable fashion and rear-ending someone else. So, the fact that you weren’t wearing your seatbelt, you’re not assuming the risk of any particular injury or anything of that nature. So you can still make a recovery for your broken teeth. Greg: And what we see is we see a lot of these bus cases that we handle, some of these bus companies just aren’t doing a great job with the hiring of the bus drivers, the training of the bus drivers, the supervision of the bus drivers, and even on the maintenance end of it. So, if you have a bus accident question, pick up the phone, give us a call. We’ve had great results. Ed: Yeah, it’s like tractor-trailer cases. Buses have to comply with the same rules and regulations that tractor-trailers do with the Federal Motor Carrier Safety Administration regulations. We’ve been seeing time and time again that they’re simply not doing that so if you have a question, call us. Dave: The number and website are there. They’re easy to remember. If you need help, then results matter with attorneys Greg Fellerman and Ed Ciarimboli. Thanks guys.